For other uses, see Planes (disambiguation). Like many of Disneytoon's films, it was initially set to be released as a direct-to-video film, but was instead theatrically released on August 9, 2013 in the Disney Digital 3D and RealD 3D formats. The film grossed $239.3 million worldwide on a $50 million budget, despite receiving negative reviews from critics. A sequel, titled Planes: Fire & Rescue, was theatrically released on July 18, 2014. Dusty Crophopper is a crop duster plane who works at a cornfield and practices aerobatic maneuvers in his spare time, dreaming of becoming a racer. His dreams are scorned by his boss, Leadbottom, and his forklift/mechanic friend, Dottie. However, he is supported by his fuel truck friend, Chug. Dusty and Chug train for qualifiers for the upcoming Wings Across the Globe race. On the night before the qualifiers, Dusty asks an elderly navy war plane named Skipper Riley to teach him how to fly well, but Skipper refuses. Dusty barely qualifies for the race. Skipper decides to mentor Dusty, and discovers Dusty has a fear of heights. With training complete, Dusty travels to New York City to start the race. There he befriends a Mexican race plane named El Chupacabra, who falls in love with a French-Canadian racer named Rochelle, who shows no interest in him. Three-time winner Ripslinger rudely dismisses Dusty. Dusty falls in love with an Indian racer plane named Ishani, who becomes supportive of him. During the first leg of the race from New York to Iceland, Dusty's refusal to fly high causes him to finish in last place. During the second leg of the race to Germany, Dusty shows good sportsmanship by saving another racer, Bulldog, from crashing, winning Bulldog's respect but finishing last again. After the third leg of the race to Agra in India, Ishani invites Dusty to fly around the Taj Mahal and advises him to fly low through the Himalayas by following some railroad tracks. After flying through a tunnel, Dusty is in first place at Upper Mustang in Nepal, but he realizes that Ishani deliberately gave him bad advice, and he shuns her. As the race continues towards Shanghai, Dusty maintains his lead. In Shanghai, Dusty helps El Chupacabra woo Rochelle with a romantic song. In the sixth leg of the race across the Pacific, Ripslinger's henchmen sabotage Dusty's navigation antenna. Lost and low on fuel, Dusty comes across the USS Flysenhower which allows him to land and refuel. On the carrier, Dusty discovers that Skipper only flew one war mission, which contradicts his reputation. Continuing the race, Dusty crashes into the ocean but is rescued. Severely damaged, he is flown to Mexico. Skipper confesses that his one mission leading trainees turned tragic, and Skipper was the only survivor. Dusty considers dropping out of the race but is encouraged by his friends who donate repair parts. Racing back to New York, Ripslinger plots to finish off Dusty but he is thwarted by Skipper. Dusty conquers his fear of heights when he is forced to ride the jetstream. Nearing the finish line, Ripslinger slows for the cameras while Dusty passes him to win. Ripslinger crashes into portable toilets. Dusty is congratulated by his friends, and Skipper thanks him for giving him the confidence to fly again. Skipper rejoins the navy, flying one last time with Dusty. Dane Cook as Dusty Crophopper. He was inspired by the Air Tractor AT-502, Cessna 188 and the PZL-Mielec M-18 Dromader. Stacy Keach as Skipper Riley, a Chance Vought F4U Corsair and Dusty's mentor (who appeared in the Cars Toons episode "Air Mater"). Danny Mann as Sparky, a forklift (who appeared in the Cars Toons episode "Air Mater"). Julia Louis-Dreyfus as Rochelle, a racing plane inspired by the Bay Super V, a conversion of the V-tail Model 35 Beechcraft Bonanza. Originally from Quebec, her flag and paint job are localized in 11 countries. In Australia and New Zealand, Rochelle is re-contextualized as a former Tasmanian mail delivery plane, and is voiced by Jessica Marais. In Italian, she is Azzurra, an Italian prototype plane voiced by Micaela Ramazzotti. Roger Craig Smith as Ripslinger, a custom-built carbon-fiber plane (most likely inspired by a modified P-51D Mustang for racing) and Dusty's rival. Val Kilmer as Bravo, a Boeing F/A-18E Super Hornet from U.S Navy fighter squadron VFA-103. Anthony Edwards as Echo, another Boeing F/A-18E Super Hornet from U.S Navy fighter squadron VFA-103. Brent Musburger as Brent Mustangburger, a 1964½ Ford Mustang (who appeared in Cars 2). Planes is based on a concept created by John Lasseter. Although Pixar did not produce the film, Lasseter, then-chief creative officer of both Pixar and Walt Disney Animation Studios, and director of Cars and Cars 2, was also the executive producer of the film. The writers made a conscious effort to not remake Cars in a new setting, rejecting ideas that were too close to ideas in Cars. The team also conducted research by interviewing several pilots of plane types that were included in the movie. Jon Cryer was initially announced as the voice of the main protagonist Dusty, but later dropped out and was replaced by Dane Cook. A modified version of the teaser trailer for the film (featuring Cook's voice in place of Cryer's) was released on February 27, 2013. Cryer did however receive credit on the film for "additional story material", along with Bobs Gannaway. Prana Studios provided work on visual effects, animation and compositing. 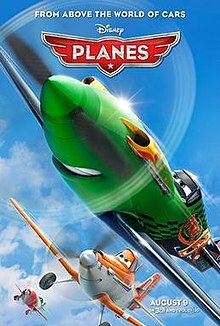 Planes was originally set to be released in North America as a direct-to-video film in Fall 2013, while having a theatrical release in Europe. However, in December 2012 Disney announced that the film would be released theatrically. This was the first Disneytoon Studios film released theatrically in North America since Pooh's Heffalump Movie eight and a half years earlier in 2005. The film premiered on August 2, 2013, at a special screening at The Fly-In Theater at EAA AirVenture Oshkosh, an annual gathering of aviation enthusiasts in Oshkosh, Wisconsin. Along with the special screening of the movie, Disney brought a real life Dusty to be part of the activities. The real life version of Dusty was an Air Tractor AT-400A piloted and owned by agriculture pilot Rusty Lindeman. The film was theatrically released on August 9, 2013, when it was also screened at the D23 Expo in Anaheim, California, a biennial convention for Disney fans. Planes was released by Walt Disney Studios Home Entertainment on DVD, Blu-ray and Blu-ray 3D on November 19, 2013. Blu-ray bonus features include "Franz's Song", an alternate sequence produced exclusively for the Blu-ray and HD digital releases, the featurette "Klay's Flight Plan", which follows director Klay Hall's personal journey during the making of the film, two deleted scenes with introductions by the director and producer, character interstitials, and "Top Ten Flyers", a countdown of history's greatest aviators hosted by Colin Cowherd. The review aggregator website Rotten Tomatoes reported a 25% approval rating with an average rating of 4.6/10 based on 116 reviews. The website's consensus reads, "Planes has enough bright colors, goofy voices, and slick animation to distract some young viewers for 92 minutes -- and probably sell plenty of toys in the bargain -- but on nearly every other level, it's a Disney disappointment." Another review aggregator, Metacritic, which assigns a normalized rating out of 100 top reviews from mainstream critics, calculated a score of 39 based on 32 reviews, indicating "generally unfavorable reviews". However, the film earned an A− from audiences polled by CinemaScore. Peter Hartlaub of the San Francisco Chronicle gave the film two and half stars out of four, saying, "Many will enter theaters thinking this is a Pixar film, with the raised expectations that accompany that mistake. But even cynical animation fans will see there's quality here. After a little turbulence, Planes comes in for a nice landing." Alonso Duralde of The Wrap gave the film a positive review, saying, "As shameless an attempt by Disney to sell more bedspreads to the under-10s as Planes is, it nonetheless manages to be a minor lark that will at least mildly amuse anyone who ever thrust their arms outward and pretended to soar over the landscape." Justin Chang of Variety gave the film a negative review, saying, "Planes is so overrun with broad cultural stereotypes that it should come with free ethnic-sensitivity training for especially impressionable kids." James Rocchi of MSN Movies gave the film one out of five stars, saying, "Planes borrows a world from Cars, but even compared to that soulless exercise in well-merchandised animated automotive adventure, Planes is dead in its big, googly eyes and hollow inside." Michael Rechtshaffen of The Hollywood Reporter gave the film a negative review, saying, "Despite the more aerodynamic setting, this Cars 3D offshoot emerges as an uninspired retread." Jordan Hoffman of the New York Daily News gave the film one out of five stars, saying, "The jokes in Planes are runway flat, and parents will likely reach for the air-sickness bag." Bill Goodykoontz of The Arizona Republic gave the film two out of five stars, saying, "Planes was originally scheduled to be released straight to video. Although the smallest children might like bits and pieces of it, there's nothing in the movie that suggests why Disney strayed from its original plan." David Hiltbrand of The Philadelphia Inquirer gave the film one out of four stars, saying, "The animated film has all the hallmarks of a straight-to-DVD project — inferior plot, dull writing, cheap drawing — perhaps because it was intended for the bargain bin at Target, Walmart, and Costco." Jen Chaney of The Washington Post gave the film one and a half stars out of four, saying, "This film is 100 percent devoid of surprises. It's the story of an underestimated underdog that's like every other kid-friendly, life-coachy story about an underestimated underdog." Rafer Guzman of Newsday gave the film one and a half stars out of four, saying, "If Planes were a reasonably priced download, you'd gladly use it to sedate your kids during a long car ride. As a theatrical, 3-D release, however, Planes will sedate you, too." Neil Genzlinger of The New York Times gave the film two out of five stars, saying, Planes is for the most part content to imitate rather than innovate, presumably hoping to reap a respectable fraction of the box office numbers of Cars and Cars 2, which together made hundreds of millions of dollars." Lou Lumenick of the New York Post gave the film two and a half stars out of four, saying, "Often less really is more, and that's why I can recommend Planes, a charmingly modest low-budget spin-off from Pixar's Cars that provides more thrills and laughs for young children and their parents than many of its more elaborate brethren." Bruce Demara of the Toronto Star gave the film two and a half stars out of four, saying, "While the plotting is rather pedestrian, the humour mostly lame, what makes Planes a stand-out experience — not surprisingly, based on Disney's vast and impressive history of animated classics — is the visuals." Claudia Puig of USA Today gave the film two out of four stars, saying, "It's engaging enough, driving home the familiar message of following one's dreams and the less hackneyed theme of facing one's fears. But it feels far too familiar." Betsy Sharkey of the Los Angeles Times gave the film two and a half stars out of four, saying, "As with Cars, the world of Planes feels safe. A little too safe, perhaps." Richard Roeper of the Chicago Sun-Times gave the film a C, saying "Planes moves along quickly at a running time of 92 minutes, occasionally taking flight with some pretty nifty flight sequences. The animation is first-rate, and the Corningware colors are soothing eye candy." Planes, despite negative reception, grossed $90,288,712 in the United States and Canada, and $148,970,000 in other countries, for a worldwide total of $239,258,712, and was a box office success. The film opened to number three in its first weekend, with $22,232,291, behind Elysium and We're the Millers. In its second weekend, the film dropped to number four, grossing an additional $13,388,534. In its third weekend, the film dropped to number five, grossing $8,575,214. In its fourth weekend, the film stayed at number five, grossing $7,751,705. The film's score was composed by Mark Mancina. The soundtrack was released by Walt Disney Records on August 6, 2013. All music composed by Mark Mancina, except as noted. Disney Interactive released Disney Planes, a video game based on the film, on August 6, 2013. It was released on Wii U, Wii, Nintendo 3DS, and Nintendo DS. A sequel, titled Planes: Fire & Rescue, was theatrically released on July 18, 2014. Bobs Gannaway, co-creator of Jake and the Never Land Pirates and co-director of Secret of the Wings, directed the film. Dane Cook reprised his role of Dusty, and was joined by Julie Bowen as the voice of Lil' Dipper. Rather than publishing an Art of book for Planes, Chronicle Books published The Art of Planes 1 & 2 alongside the sequel's theatrical release. The music for the film was again composed by Mark Mancina. ^ a b c DeMott, Rick (August 23, 2011). "Jon Cryer Leads Voice Cast For DisneyToon's Planes". DisneyToon Studio via Animation World Network. Retrieved November 5, 2011. ^ "Disney's 'Planes' Will Take Off in Theaters in 3D". Stitch Kingdom. January 16, 2013. Retrieved June 14, 2013. ^ Armstrong, Josh (May 15, 2013). "Tinker Bell scribe revealed as Planes screenwriter". Animated Views. Retrieved May 15, 2013. ^ "Mark Mancina Scoring Disney's 'Planes'". May 17, 2013. ^ a b Armstrong, Josh (April 29, 2013). "Disney's Planes to take off at EAA AirVenture Oshkosh". Animated Views. Retrieved May 1, 2013. ^ a b c d "Disney Sets Cars Spinoff Planes for a Theatrical Release". ComingSoon.net. December 21, 2012. Retrieved July 2, 2013. ^ "PLANES (U)". British Board of Film Classification. July 16, 2013. Archived from the original on October 5, 2013. Retrieved July 16, 2013. ^ a b c d "Planes (2013)". Box Office Mojo. Retrieved December 21, 2013. ^ Goldberg, Matt (February 17, 2011). "Disney Officially Announces PLANES, a Direct-to-DVD Spin-Off of Pixar's CARS". Collider.com. Retrieved March 1, 2013. ^ a b Bastoli, Mike (June 11, 2012). "Disney Changes 'Planes' Release Date". Big Screen Animation. Archived from the original on June 16, 2012. Retrieved June 11, 2012. ^ a b Fleming, Mike (June 13, 2013). "More Disney Release Dates: Two New Marvel Pics, 'Alexander', 'Hundred-Foot Journey', 'Into The Woods', 'Planes' Sequel Slotted". Deadline. Retrieved June 14, 2013. ^ a b Strecker, Erin. "Dane Cook to voice lead in Disney's 'Planes'". Entertainment Weekly. Retrieved March 8, 2013. ^ a b c d e f g h i j k l m Alexander, Bryan (March 25, 2013). "Look! Up in the sky! It's an exclusive peek at 'Planes'!". USA Today. Retrieved March 26, 2013. ^ Rechtshaffen, Michael (August 6, 2013). "Planes: Film Review". The Hollywood Reporter. Retrieved August 7, 2013. ^ a b Phippen, Rich (August 14, 2013). "Planes: Jeff Howard on writing the spin-off". Skymovies. Archived from the original on December 2, 2013. Retrieved August 23, 2013. ^ "New Trailer for Disney's Planes Flies In". ComingSoon.net. February 27, 2013. Retrieved February 27, 2013. ^ "Planes Review". Screendaily.com. August 7, 2013. Retrieved November 20, 2013. ^ Verrier, Richard (March 29, 2016). "Rhythm & Hues finalizes sale to Prana Studios". Los Angeles Times. Retrieved June 28, 2016. ^ a b "Disney Planes Hero 'Dusty' to Appear in Oshkosh". Air Venture. May 30, 2013. Retrieved August 25, 2013. ^ Sacco, Dominic (October 5, 2012). "INTERVIEW: Anna Chapman, Disney". ToyNews. Archived from the original on October 19, 2012. Retrieved October 21, 2012. ^ "Be the First to See Disney's Planes". D23.com. July 1, 2013. Retrieved July 2, 2013. ^ "Disney's Planes 2D & 3D Blu-rays". Blu-ray.com. September 27, 2013. Retrieved September 27, 2013. ^ "Planes (2013)". Rotten Tomatoes. Retrieved April 15, 2014. ^ "Planes". Metacritic. Retrieved August 7, 2013. ^ Finke, Nikki (August 10, 2013). "Friday: 'Elysium' #1, 'We're The Millers' #2, 'Planes' #3, 'Percy Jackson: Monsters' #4". Deadline. Retrieved August 10, 2013. ^ Hartlaub, Peter. "'Planes' review: Familiar plot achieves lift-off". Sfchronicle.com. Retrieved August 9, 2013. ^ Duralde, Alonso. "'Planes' Review: More Fun, at Least, Than Being Stuck in 'Cars'". Thewrap.com. Retrieved August 9, 2013. ^ McNary, Dave (July 27, 2013). "'Planes' Review: Disney's 'Cars' Spinoff Is a Clunker". Variety. Retrieved August 9, 2013. ^ "Disney's Planes (2013)". Movies.msn.com. Retrieved August 9, 2013. ^ Rechtshaffen, Michael (June 8, 2013). "Planes Review". The Hollywood Reporter. Retrieved August 9, 2013. ^ "'Planes,' movie review". New York: NY Daily News. Retrieved August 9, 2013. ^ "'Planes,' 2 stars". The Arizona Republic. January 12, 2014. Retrieved January 17, 2014. ^ David Hiltbrand; Inquirer TV Critic (October 22, 2012). "Disney's 'Planes' crashes and burns". Philly.com. Retrieved August 9, 2013. ^ Jen Chaney (February 24, 2011). "'Planes' doesn't earn its wings". The Washington Post. Retrieved August 9, 2013. ^ "'Planes' review: Not cleared for takeoff". Newsday.com. Retrieved August 9, 2013. ^ Genzlinger, Neil (January 12, 2014). "'Disney's Planes' Follows in the Footsteps of 'Cars'". The New York Times. Retrieved January 17, 2014. ^ Lumenick, Lou (August 8, 2013). "'Planes' movie review". NYPOST.com. Retrieved August 9, 2013. ^ Claudia Puig, USA TODAY (August 8, 2013). "'Planes' has a strong air of familiarity". Usatoday.com. Retrieved August 9, 2013. ^ Sharkey, Betsy (August 8, 2013). "Review: 'Planes' stays grounded while it might have soared". latimes.com. Retrieved August 9, 2013. ^ "Disney's forgettable 'Planes' deserves few props - Chicago Sun-Times". Suntimes.com. Retrieved August 14, 2013. ^ Keogh, Tom. "'Planes': Disney takes to the skies for high adventure | Entertainment". The Seattle Times. Retrieved August 9, 2013. ^ New Jersey (November 1, 2011). "'Planes' review: New cartoon never takes off". NJ.com. Retrieved August 10, 2013. ^ Gleiberman, Owen (August 10, 2013). "Planes Review". Entertainment Weekly. Retrieved August 11, 2013. ^ A.A. Dowd August 8, 2013. "Planes | Film | Movie Review". The A.V. Club. Retrieved August 10, 2013. ^ "Planes | Film Review". Slant Magazine. Retrieved August 10, 2013. ^ Dave Calhoun. "Planes | review, synopsis, book tickets, showtimes, movie release date | Time Out London". Timeout.com. Retrieved August 14, 2013. ^ "Weekend Box Office Results for August 9-11, 2013". Box Office Mojo. Retrieved August 12, 2013. ^ "Weekend Box Office Results for August 16-18, 2013". Box Office Mojo. Retrieved August 18, 2013. ^ "Weekend Box Office Results for August 23-25, 2013". Box Office Mojo. Retrieved January 16, 2014. ^ "Weekend Box Office Results for August 30-September 1, 2013". Box Office Mojo. September 1, 2013. Retrieved January 16, 2014. ^ "Three-Time Grammy(R)-Winning Composer Mark Mancina Makes Score Soar With Planes Soundtrack". The Wall Street Journal. July 30, 2013. Retrieved August 3, 2013. ^ Fletcher, JC (April 10, 2013). "Disney's Planes adapted into Wii U, Wii, 3DS, and DS games this August". Joystiq. Retrieved April 10, 2013. ^ Bastoli, Mike (June 12, 2012). "Exclusive: DisneyToon Already Working on Planes Sequel". Big Screen Animation. Archived from the original on August 7, 2012. Retrieved September 19, 2012. ^ Armstrong, Josh (May 10, 2013). "Exclusive: The Art of Planes book to coincide with Planes 2". Animated Views. Retrieved May 10, 2013. ^ "Mark Mancina to Return for 'Planes: Fire & Rescue'". Film Music Reporter. November 28, 2013. Retrieved December 22, 2013.